﻿Does Ultram show up on drug tests? No, Ultram is usually not detected on standard drug tests that screen for a panel of only 3 or 5 drugs. But, Ultram (tramadol) WILL show up on toxicology screening for opioid prescription medications. More on Ultram drug tests, detection, and timeline here. Answer: Yes and no. It depends on the type of drug test. However, Ultram (tramadol) WILL show up on toxicology screenings for specific opioid prescription medications. This is called an “extended” drug panel test. Read more on the specifics of drug testing for Ultram, here. Additionally, if you have any questions, you are welcome to post them in the section below. We always try to respond personally and promptly to all legitimate inquiries. Why order a drug test for Ultram? 1. Medical – Your prescribing doctor may schedule a random drug test for Ultram every once in a while to monitor your adherence to therapy. Doctors can also drug test you if you are admitted to a hospital under the suspicion of drug overdose. 2. Work – Ultram abuse affects employees’ health and safety. The misuse of Ultram might also be responsible for decreased productivity in the work place. Drug testing allows companies to early identify and refer employees with drug or alcohol problems to rehab. If you are taking Ultram, it is important to know that drug testing laws are not the same for every State and profession. If you live in a State which gives employers the freedom to decide what they want to include in their drug test and they decide to test for Ultram, then it will be detected. 3. School – High school administrators that suspect recent drug use may request (depending on the school district) random or “reasonable suspicion” drug tests to ensure that the school is drug-free. School counselors are also looking for signs of opioid addiction. Consequences of testing positive for an opioid like tramadol can lead to missed school or expulsion. 4. Legal reasons– If you’ve been in a situation before where you’ve abused Ultram by taking it other than prescribed, you may be required to do Ultram drug test due to legal implication. 5. Other Reasonable Suspicion (cause testing) – If you show signs and symptoms of Ultram abuse, or display patterns of abnormal behavior which raise suspicion, you may be subjected to “reasonable suspicion drug testing”. Q: Can Ultram show up on a pre-employment drug tests? 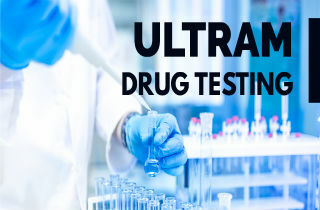 Ultram is usually not tested for on standard pre-employment drug tests. However, there are toxicology screenings that are specifically designed to test for the presence of prescription medications such as Ultram. How long can Ultram be detected in drug tests? Medical literature indicates that Ultram’s elimination half-life is around 6.3 hours. This means that it will be eliminated from your system in about 48 hours. However, its primary metabolite O-desmethyltramadol (M1) has a bit longer half-life of 7.4 hours and can be detected for almost 2 days. Toxicology screenings can detect Ultram and its metabolites for 2-4 days max after the last administration. IN HAIR – Hair tests can detect Ultram even when it’s taken in very low levels. These levels are in the range of 0.07-0.80 ng/mg of hair, and usually appear when the drug is taken as prescribed by a doctor. For comparison, in cases of Ultram abuse, concentrations are significantly high and within the range of 0.22-1.18 ng/mg of hair. IN URINE – Medical experts say that urine tests are not as effective because Ultram is metabolized very quickly. The drug and its metabolites are usually out of your urine within 2 days since the last dosing. IN SALIVA – Research shows that when you take Ultram, around 87% can be detected in your oral fluid. The medication should start to show in saliva drug tests within an hour of ingestion. Then it may remain detectable for over 24 hours. IN BLOOD – Blood testing only offers a short Ultram detection window. The drug is usually detectable within an hour of ingestion, but does not show up on blood drug tests 24 hours after the last dosing. If you are prescribed Ultram and your test comes back positive – it shouldn’t be a problem. This way, your Ultram use is justified due to medical reasons. However, know that Ultram is a controlled substance in all 50 U.S. states since July 7, 2014. Taking it without a legitimate prescription and getting caught can bring on many legal problems and possibly job loss. With this fact in mind, it’s very important to tell the administrators of the test in case you are taking Ultram as part of a treatment program. But, it is a Medical Review Officer’s (MRO’s) job to determine whether there is a legitimate explanation for the positive Ultram test results. The repercussions of obtaining and using Ultram very depending on the court system of the State where you live. Do you still have questions about Ultram detectability on drug tests. Please send us your questions by posting them in the comments section at the end of the page. We try to respond to all legitimate inquiries with a personal and prompt answer. I have a question…I do not take hydrocodon…. if I took a 10 Panel urine test and it showed positive for hydrocodon could that be because I am taking Tramadol? Is it possible or no? Not regular user of tramadol .. combination of 37.5 mg tramadol and 365 paracetamol .. 1-3 times a week max two dosages a day .. taken Thursday .. Will it show on Monday .. medical test for visa . I was given a urine test that tested these: amphetamine, benzo, bup , cocaine, illicit, methadone, opiate agonist, psychotropic, soma, thc, pcp, opiate, barb. I take tramadol.Dr asked if I took hydrocodone or oxycodone, I do NOT. He said I tested positive for opiate. (0.6 ng/mg was the cutt-off range) Could tramadol be why opiate was positive? Hi Stacey. It depends on the type of drug test. I suggest that you consult with your doctor about this. We suspect that my mother was given an overdose of tramadol in her care facility. She was definitely doped with some kind of medication, probably on accident – they claim she was just tired… we visit her all the time and we absolutely don’t believe it!! Normally she takes 50 mg twice a day. We asked for a toxicology report and it came back negative for opioids. Should we suspect a problem here ? Hi Donna. Tramadol isn’t going to show up on standard drug tests, Tramadol will show up on a toxicology screening specifically designed for prescription drug detection. Since your mother was using only Tramadol, and not other opioids, the report came back negative. Hello, i have been tested for multi drug test & Tramal result shows positive! I have never tried or taken tramal or any kf this kind if medicine, the only think that i took before the test was advil cold & sinus & telefast (for allergy), how come the result showed positive & i have never taken tramal? From where the result cam be positive? Im sure that no one gave me any medicne that i dont know. Could you help please? Can tramadol or ultram come up as propoxyphene in a urine drug test?